Type: Here you should always chose Pernament (301) as it will all general redirect uses. Under you can add the rest of the domain you want to redirect (this is optional). If, for example, you want to redirect hydro.yourdomain.net.au/fire/ to firesafety.com.au just type fire/ in this box. Redirects to: (1) Type the link you want the domain redirected to, make sure to start with http:// or https:// (2) make sure to select Redirects with or without www unless you have a specific reason for only redirecting (3) click Add. Wild Card Redirects: This option acts as a * (wildcard) infront of your redirect. 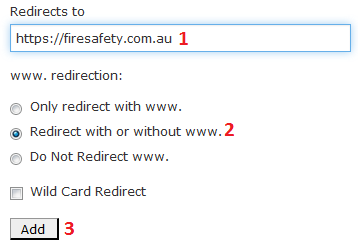 So if, for example, you redirect hydro.yourdomain.net.au/ to firesafety.com.au/ with Wild Card Redirects turned on. if a user visits, for example, hydro.yourdomain.net.au/page1/ it will automatically redirect to firesafety.com.au/page 1, hydro.yourdomain.net.au/page2 will automatically redirect to firesafey.com.au/page2/ etc. How do I Enable PHP Error Logging on Web and Reseller Hosting?